The construction boom represents a 10-year peak, and there’s more to come. The building boom sweeping downtown Seattle is hard to miss, between the jostling cranes, giant holes in the ground and construction crews closing down streets. But new data shows just how intense things have gotten — and how much more is still yet to come. 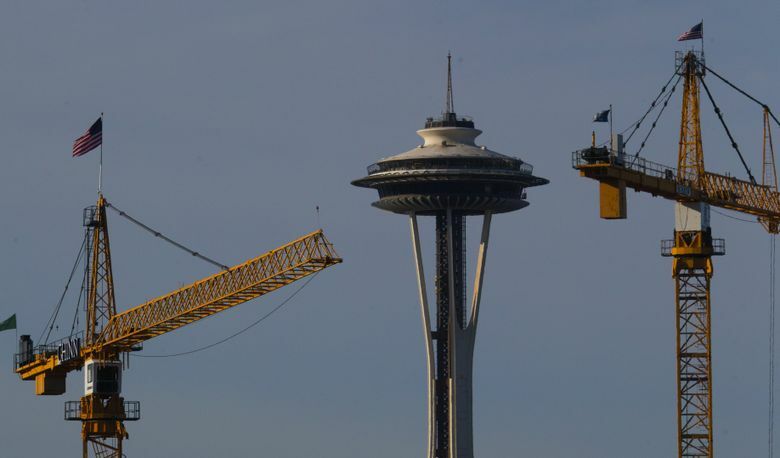 There are currently 65 major buildings under construction across downtown, South Lake Union and surrounding neighborhoods, more than at any point since the figures were first tracked in 2005, the Downtown Seattle Association said in a new report Tuesday. The previous mid-year high was 50 buildings under construction in 2014 and 49 last year. “There is a ton of development on all fronts,” said Don Blakeney, a vice president for the downtown group. And the frenzy isn’t set to end anytime soon: Most of the structures will take until next year to finish, and there are dozens more in the pipeline set to start in the next year and a half. About two-thirds of the project are residential. 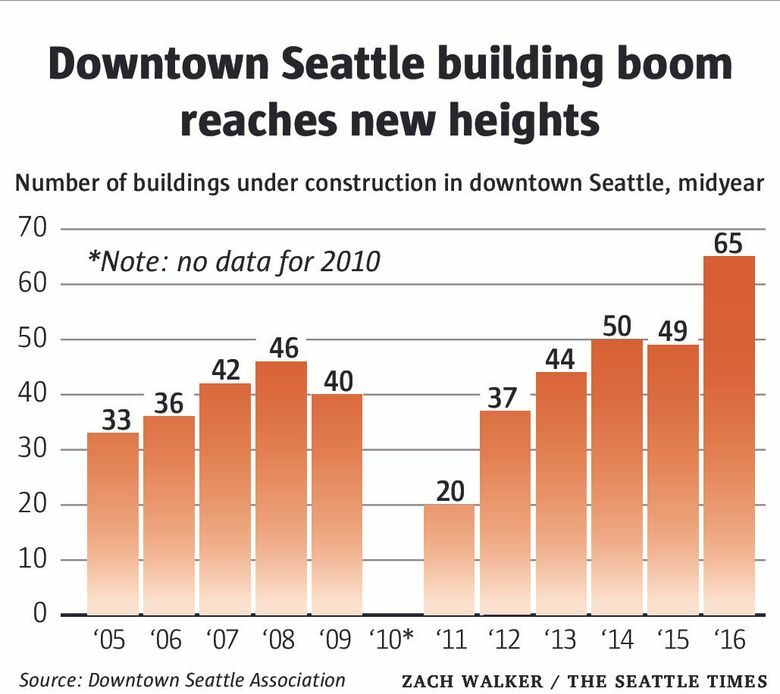 The number of housing units under construction downtown has also hit a new high since 2005. After a record-setting year last year for new homes downtown, there are still even more on tap for this year and the next — 8,661 in all downtown, more than the entire city of San Francisco has added in the last three years. Altogether, by the time current projects are done, downtown Seattle will have added 44 percent more housing units than it had at the start of the decade. “It’s a sign of the times that people want to live close to where they work, and have access to the things that are available in a major city,” Blakeney said. Still, all that new housing hasn’t yet stopped the soaring housing costs sweeping the region, as Seattle remains among the cities with the fastest-rising rents and home prices in the nation. Office buildings are still booming, too: 5.7 million square feet of it is under construction, down a little from last year but double the amount from three years ago. More than one-third of the office under construction is for Amazon. The downtown group says the internet behemoth is on pace to occupy 12 million square feet of office space by the time current projects are finished. That’s the equivalent of eight Columbia Centers, the tallest building in Seattle at 76 stories. But other companies expanding their presence here, too, including Facebook, Expedia and Google. The office building spree is only the beginning. There is more square footage of downtown office space planned for the coming years than was built in the past decade, although not all of it will necessarily become reality. Kevin Daniels, a developer building the largest project under construction in the region (a $400 million hotel and office skyscraper called The Mark sprouting up on Fifth Avenue), sees a mixed bag looking forward. He doesn’t anticipate much more office construction beyond the plans already in the pipeline, but affordability issues are going to keep driving the need to build more residential projects, he said. “I see it continuing,” Daniels said. “We haven’t balanced out on the market” in terms of supply and demand. The projects are spread around Seattle’s downtown, which the association defines as the area running roughly east-west from to Broadway to Elliott Bay, and north-south from South Lake Union to the stadiums. But some clusters of development are especially notable. In one two-block-by-two-block stretch between Ninth Avenue and Highway 99, there are 14 projects either under construction, recently completed or in planning stages. In a five-block stretch of Second and Third avenues, between Union and Lenora streets, there are 13 projects going on now, on tap or recently completed. There is a lot of money to be made in the building boom. The downtown association pegs the total value of all the construction projects going on now at $3.5 billion, down a little from last year but more than double the total from five years earlier. One smaller but notable driver in the construction frenzy is the hotel industry. After a slowdown that saw only 700 hotel rooms get built downtown in the last five years, there are nearly 3,000 scheduled to open in the next couple of years. Update: The sidebar in this post about the most expensive projects has been updated to include the 8th and Howell project not originally included in the downtown association’s list.